Have more questions? There’s an FAQ page for that. Also, just as we did in January, we’re still accepting donations to help us send more prizes out to international winners through the PayPal donate button on the sidebar. And if you’d like to donate prizes directly, send us an email at 24in48readathonofficial@gmail.com. Ready to join? Fill out the form below (or if you’re having trouble, click through here) and feel free to list any and all of the places you’ll be hanging out online during the ‘thon. Check out who else is participating. If your entry doesn’t immediately pop in to the spreadsheet, give it a few minutes to populate. And you can follow the readathon in all the normal places. 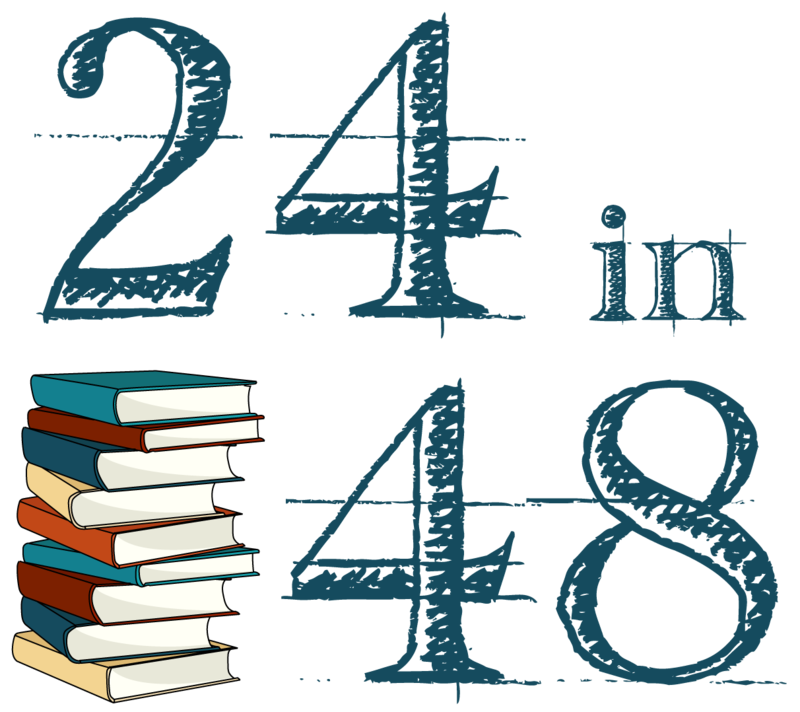 We’re on Twitter, Instagram, Facebook, and Litsy (@24in48) and you can use the official hashtag #24in48 everywhere to keep up with your fellow readathon-ers. It’s been fixed, try it again! I tried too and it has the optional questions set as required. That’s been fixed! You can try again. The form isn’t showing up for me ): I’m on google chrome. Give it a try on another browser or on a computer. Chrome on mobile doesn’t like the forms. The form just shows a sad face for me. If you’re on mobile, you might need to switch browsers or try a computer. Unable to submit the form. Yahoo! I can’t wait! Going to try and beat my personal record from last time! Give it another try, I think we’ve gotten the problem fixed. I keep getting the dead eye face on the sign-up form. Hi, we’ve fixed the issue (hopefully!) – give it another try. The sign in form is not working. It is a sad face up there. I think it should be fixed now! Give it another try. The issue seems to be with the Chrome browser. I think we’ve fixed the issue. Give it another try. Give it another try. I believe we’ve fixed the issue. Total Newbie here. I don’t know if I did it right, but I can #24in48readathon on my sites, so I’m sure it will be fine. Hi Linda, I don’t see your name in the sign-up sheet. You might want to give it another try and let us know if you have any trouble submitting. Also make sure you’re using the official hashtag #24in48! This is my first time participating, and I accidentally signed up twice (I somehow missed my name when I checked the participants list)–is there a way I can delete the second one? We’ll delete it for you! I’m in again, and being more strategic this time. Already have my stacks!